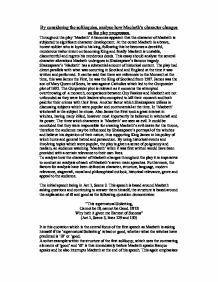 By considering the soliloquies, analyse how Macbeth's character changes as the play progresses. By considering the soliloquies, analyse how Macbeth's character changes as the play progresses. Throughout the play 'Macbeth' it becomes apparent that the character of Macbeth is subjected to significant character development. At the outset Macbeth is a brave, honest soldier who is loyal to his king, following this he becomes a deceitful, murderous traitor intent on becoming King and finally Macbeth is unstable, discontentful and regrets his murderous deeds. 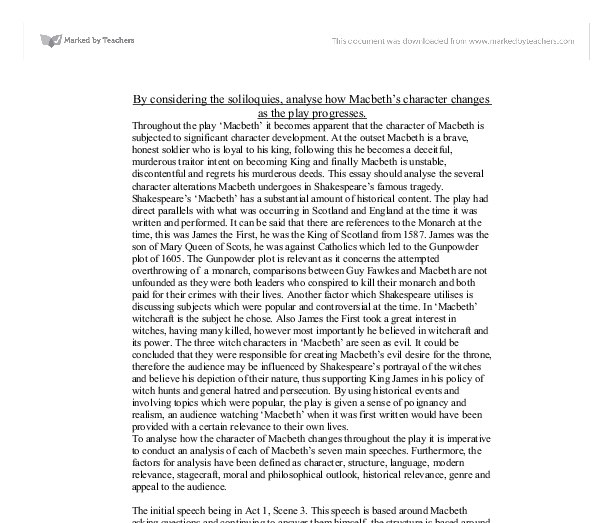 This essay should analyse the several character alterations Macbeth undergoes in Shakespeare's famous tragedy. Shakespeare's 'Macbeth' has a substantial amount of historical content. The play had direct parallels with what was occurring in Scotland and England at the time it was written and performed. It can be said that there are references to the Monarch at the time, this was James the First, he was the King of Scotland from 1587. James was the son of Mary Queen of Scots, he was against Catholics which led to the Gunpowder plot of 1605. The Gunpowder plot is relevant as it concerns the attempted overthrowing of a monarch, comparisons between Guy Fawkes and Macbeth are not unfounded as they were both leaders who conspired to kill their monarch and both paid for their crimes with their lives. Another factor which Shakespeare utilises is discussing subjects which were popular and controversial at the time. In 'Macbeth' witchcraft is the subject he chose. Also James the First took a great interest in witches, having many killed, however most importantly he believed in witchcraft and its power. The three witch characters in 'Macbeth' are seen as evil. It could be concluded that they were responsible for creating Macbeth's evil desire for the throne, therefore the audience may be influenced by Shakespeare's portrayal of the witches and believe his depiction of their nature, thus supporting King James in his policy of witch hunts and general hatred and persecution. By using historical events and involving topics which were popular, the play is given a sense of poignancy and realism, an audience watching 'Macbeth' when it was first written would have been provided with a certain relevance to their own lives. ...read more. However Macbeth recognises that it is his ambition to become King that will lead to his downfall. "But in these cases We still have Judgement here, that we but teach Bloody Instructions, which, being taught, return To plague th' Inventor" (Act 1, Scene 7, Lines 7-10) This quotation shows how Macbeth is aware that his bad deeds will come back and "plague" him, this is a major factor which occurs in nearly all of Shakespeare's tragedies - where the main character contributes to his own downfall. To conclude, this speech is a point in the play where the audience may start to really dislike his character. He is showing no signs of doubt or even thinking what he and his wife are planning to do is wrong. It shows he can not differentiate between good and evil because he is so ambitious he is focused only on becoming King and it does not matter to him how he achieves his goal. The fourth speech is situated immediately before the Murder of Duncon, when Macbeth is waiting to hear the bell which is the sign for him to go to Duncon's room and kill him. This is a very nervous time for Macbeth his mind is tormented thus him hallucinating, he sees a dagger. "Is this a Dagger which I see before me, The handle toward my Hand?" (Act 2, Scene 1, Lines 32 and 33) Making Macbeth see things - a dagger - makes the play more interesting this speech is very much building up to the murder and it is very effective is adding an air of apprehension. There is a sense that there is no going back. The general tone of Macbeth would be nervous perhaps whispering and the set would be that of a dark and gloomy corridor in his castle. The bell which Lady Macbeth rings is a sign for the act of murder to begin, this adds to the intensity of the speech, it may make the audience jump. ...read more. Will they be realistic and sacrifice everything for personal gain like Macbeth? This soliloquy is almost a warning showing an audience the consequences of such a selfish existence. Throughout the tragedy 'Macbeth' the audience is taken on a journey through one mans inner battles of conscience, the seven main soliloquies being the main points if character alteration, after analysing them in detail it can be said that Macbeth began the production with the best intentions, he was a loyal and respected man, perhaps he had ambition although it did not seem that he was unhealthily ambitious. However the witches preyed on his ambition by planting ideas in his head of becoming king and ruling a country, these ideas were nurtured by his wife and Macbeth seemed to be quite passive at the beginning just going along with his wives plans, he was easily influenced and perhaps just wanted to appease. Macbeth progressed into a murderous character who would stop at nothing he seemed to have no moral boundaries, killing people who were previously his closest friends, his colleagues and killing women and children all for his own personal gain. At this point the killing and deceit gripped him and he became a man obsessed with killing and obsessed with himself - a very greedy and selfish man. Throughout all this it was shown through hallucinations that Macbeth was not a stable man. It became obvious to the audience though that Macbeth would not emerge successful from all this carnage. As is the way with the majority of Shakespeare's tragedies the main character contributes to his own demise and towards the end when it is obvious that he will come out of the situation the worst off Shakespeare tries to make the audience feel sympathy for the main character. In 'Macbeth', at the end, Macbeth is extremely depressed and bleakly pessimistic, and some would say he deserves what he has become. By Claire Wilson ...read more. This student written piece of work is one of many that can be found in our AS and A Level Macbeth section. of all his Thanes and now completely relies on occult prophesies which were completely still led to the demise of the once ambitious soldier, Macbeth. Macbeth - Act 4 Scene 1: Discuss the Dramatic Potential in this scene. The third witch gives reference to animals, plants, humans, and mythical animals, or animals that are hard to capture. The animals mentioned are 'wolf' 'shark' and 'goat.' The plants used are 'hemlock' and 'Yew.' There is human content too, such as, 'Jew' 'Turk' 'Tartar' 'babe' 'drab'. How does Shakespeare Create Sympathy for Macbeth? Sympathy is also created for Macbeth through Banquo, a loyal friend of Macbeth's. He bears witness to the initial prophecies made by the Three Witches (he is told his son's will be Kings). Though eager to learn his own destiny, Banquo serves as a counterpoint to how one deals with fate. Everything about the play from the way the witches speak to the setting of the play is meant to disturb us and contribute to the theme of evilness. The witches are used to strike fear into our hearts and their power is what causes Macbeth to go insane. FIRST MURDERER: Where is your husband? LADY MACDUFF: I hope in no place so unsanctified, Where such as thou mayst find him. FIRST MURDERER: He's a traitor. SON: Thou liest thou shag-ear'd villain. FIRST MURDERER: What you egg? Young fry of treachery! Macbeth - the dilemma of whether to kill the King or not. Despite the bravery of his battlefield exploits, there is a brutality evident in the nature of his fighting. In the battle he is said to have: ?unseam?d him from the nave to the chaps, And fix'd his head upon our battlements? Macbeth?s extreme allegiance to the king caused him to act very violently. ?fear? and ?cowadr? inflame Macbeth?s pride as a man, and he eventually agrees to Lady Macbeth?s plan. This may show that Lady Macbeth is playing the usual woman?s role in a dramatic relationship and guiding her husband to the path she deems best. Lady Macbeth seems strong, but in the end is tremendously weak. Macbeth. To what extent do you find the playÃ¢â‚¬â„¢s ending satisfactory?